This page is about the Russian fighter Yak-9. For other uses, see Yak-9 (Family). The Yak-9 is a rank II Russian fighter with a battle rating of 3.3 (AB) and 3.0 (RB/SB). It was introduced in Update 1.43. Rebalanced wing and cockpit placement by a slight amount. Slightly improved rearward visibility compared to previous models. New metal alloy used to construct the fuselage, meaning a lighter plane = better flight characteristics. Reworked fuel tanks, engine parts, and other internals. All of this translates in-game to an even better version of the excellent Yak-1 series. 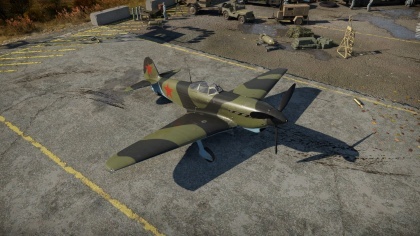 The Yak-9 is the first of a number of modifications (the T and K variants are also in-game). While tactics and methods deviate little from the previous Yaks, this plane is like being used to flying a Bf 109 E and then suddenly being given a Bf 109 F... not much, but experienced Yak pilots can feel the difference! Both Universal and Stealth ammo belts for the cannon are effective against all planes, and the Ground Attack belt gives the most HE rounds for most targets. The cannon's Ground Attack belt is also capable of defeating up to light tanks if player hits them in the rear. Low gun ammo along with no other ordnance of any kind (no rockets and bombs of any kind) make this plane weak against even soft unarmored ground targets. In Arcade Battles, the basics of Yak fighting from the previous iterations continue. Unlike Realistic or Simulator battle modes, there is no need to worry about the wooden wings ripping off, engine overheating, or being in the air without ammunition for long, which gives the Yak more liberty in its mode of attack. Fly at full speed and pump the engine to 110% (WEP) when possible and gain altitude as soon as entering the battlefield. It is recommended to climb to 3,000 m as this will allow the Yak to have a altitude advantage over many opponents who will head towards the ground while playing into the Yak's preference for low-altitude fighting. Though a full liberty of targets can be chosen from anything below the Yak, try to pick either large aircraft like attackers or bombers, or fighters that are unaware of the Yak's presence. Dive down and gain speed while conducting a Boom-N-Zoom attack. The center-mounted 20 mm and 12.7 mm guns acting together when fired is good enough to sufficiently damage an aircraft with a burst on a pass. The Yak is free to climb again and regain the altitude advantage, or turn and reengage the enemy with another pass as the Yak's turning ability is quite good in high energy, at the expense of the pilot's G-force resistance and stamina. Use trigger discipline when firing the 20 mm and 12.7 mm guns as there is a relatively small ammunition load for the two. However, due to their center-alignment on the Yak's nose, there is no need to adjust for convergence, making fire adjustments much easier for the pilot. Once the crosshair is sighted right onto target, most shots on an fully upgraded gun will hit the mark. It is recommended to hit for the weaker structural parts of enemy aircraft such as the wings as the ammunition can rip them apart in a good prolonged burst. However, all these require the Yak to have an energy advantage over an opponent. Prolonged turning engagements or other maneuvre will gradually drain the Yak of its energy and slow it to a crawl. In this state, the Yak is in its most vulnerable to enemy fighters. 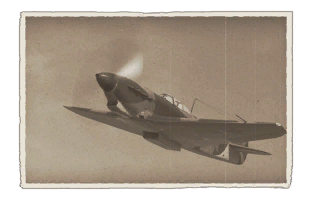 Once this lower speed is noticed, quickly withdraw from the combat and try to gain speed and altitude, the former especially if an enemy fighter suddenly starts to attack. All in all, energy is important in aerial combat when piloting Yak aircraft. Stay low, watch your ammo, and watch your engine temp. Avoid excessive diving, since the wings are still made of wood! Very accurate center mounted guns are easy to master for the player comparing to planes with wing mounted armament. Sadly this benefit is overshadowed with low ammo load that most of the time enforces strict trigger discipline (especially for the cannon). Long range attempts can be carry out by 12.7 HMG, but rather as a means of luring fleeing enemies into evasive maneuvers rather than taking it out. The Yak-9 has some vehicles it needs to consider when engaging. Japanese turning fighters - Japanese fighters like their Zeroes and Ki-43 can possess a threat as these planes can turn faster than the Yak could ever dream, so don't get suckered into turning against a Zero. Not to mention, Japanese planes are typically slower than most of its contemporaries, so a Yak trying to get a bead on one after passing through will often try to turn constantly around for another pass at these slow aircraft. Continued turns and passes will cause the Yak to lose energy and sacrifice aerial performance. This can lead other enemy aircraft or the very same Japanese aircraft the Yak was trying to strafe to coming around the slow Yak and shoot it out of the air. It is best to simply pass by a Japanese aircraft with a Boom-&-Zoom and then just climbing away to altitude away from the fighter so it couldn't try to attack. Once in a sufficient altitude, dive back down again to regain the energy during the next pass. Biplanes - Sure, if able to destroy them in the first pass, the biplane is not really the biggest threat out there. However, it is the indicator of an easy, slow target that are biplanes like the Swordfish that can cost the Yak pilot the plane. If missed, there may be an urge to quickly turn back for another quick pass against the biplane for another chance, while the biplane continues evasive manuvres. If this continues on as the Yak keeps turning for an "easy" kill, it would sacrifice much of its energy against a rather nonthreatening target. As emphasized previously, a slow Yak is an easier target to enemies and even if the biplane won't be able to dent the Yak, another enemy may swoop down an annihilate the Yak with ease. Don't waste energy trying to manuvre against a biplane, simply attack in a Boom-&-Zoom fashion. Focus on cooling and engine modifications first! Once the coolant systems and engine is upgraded, flying at 90% power will never overheat the engine! Then focusing on ammo belts can benefit greatly, since the default ammo belt is rather lackluster. After that, the New modifications for the gun should also be considered for longer firing of the guns without jamming. Past that, it is pilot preference. Center mounted armament that is very accurate even at longer distances. 20 mm supplemented with a 12.7 mm can do decent damage against enemy planes. Relatively small aircraft profile makes it a small target. Fast and agile at altitudes up to 3 km. Great turning ability when in high energy. Experience with the Yak-1 and Yak-1B carry over to this plane. Slightly better engine than predecessors. Armaments have limited ammunition, stresses on firing accuracy and discipline to make the most out of a belt. Very bad high alt performance. Once speed and energy is lost, the Yak-9 performance drops significantly. Engine overheats sometimes in RB/SB. This page was last edited on 7 April 2019, at 11:22.